New Batch Just In! So luminous and translucent emanating the Rosy Ray! 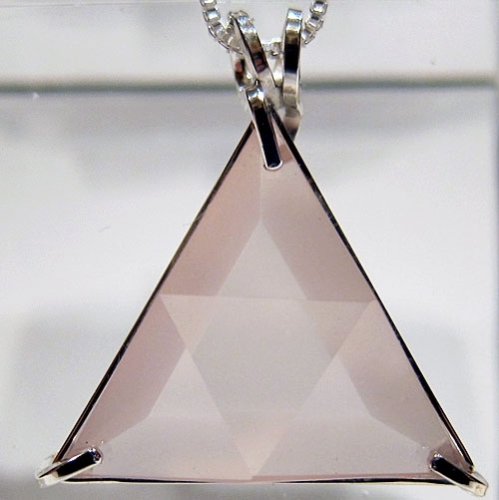 This beautiful Vogel-Cut Rose Quartz Star of David crystal pendant is virtually free of any inclusions which is very rare for rose quartz. This pendant is of exceptional quality, both in the cut of the stone and in the simple silver band setting which allows the stone to breathe and function at its highest vibration. It comes with an 18" sterling silver chain which sits upon the thymus, between the throat & the heart chakras, where it will be of most beneficial resonance. This piece is VERY clear with a lovely milky pink color. Rose quartz projects a soft, soothing, gentle energy that resonates with vibrations of love, and is especially supportive in cases where an individual is developing the capacity for self love. It sends out an energy of unconditional love, as compared with passionate love, so the energy of rose quartz resonates with the heart chakra rather than the lower chakras. Rose quartz is a gently healing stone, allowing for the slow opening of the heart to healing and loving energies. It supports the wearer or bearer of this stone in all spiritual practices and daily activities that promote the development of compassion for all beings -- and especially for oneself. Rose quartz especially creates a feeling of emotional warmth, and very gently energizes by protecting one from negative influences, lifting away depression and instilling a feeling of calm confidence. It is a wonderful tool for personal growth on ones spiritual path. Rose quartz has often been used in the treatment of wounds to the emotional body, and especially a wounded heart, but can be used effectively in treatment of wounds to the heart, throat, third eye and crown chakra. Excellent crystal to wear while meditating or to simply add beauty to your day. Facilitates concentration on higher chakras. This cut in particular, comprised of two triangles, one pointed up and the other down, makes use of a symbol that has been used for millenia and represents the merging of the higher and lower worlds, enabling us to connect to the Divine on our path of spiritual evolution. This Vogel Star of David cut in particular, comprised of two triangles, one pointed up and the other down, makes use of a symbol that has been used for millenia and represents the merging of the higher and lower worlds, enabling us to connect to the Divine on our path of spiritual evolution. Note: weight above is shipping weight. Actual weight is .30 oz. Each piece is unique & may vary slightly from photo above in appearance. Each piece is guaranteed to be beautiful and to meet with your complete satisfaction.